"Phailin"is something to be carefull of !. The storm is rapidly intensifying, and now at Cat 4, is having core pressure of 930 mb and estimated sustained core winds of 250 kmph !! The current eye is warm, and almost 80c warmer than the outer bands. Current central clouds are at -6c, compared to -86c in the outer bands. The outer wall, has shrunk, and is seen almost consuming the original eye. So, temporarily, the intensification may halt for the next 6hrs..and may even weaken a bit. But, if a perfect new eye forms, the intensification can resume again. 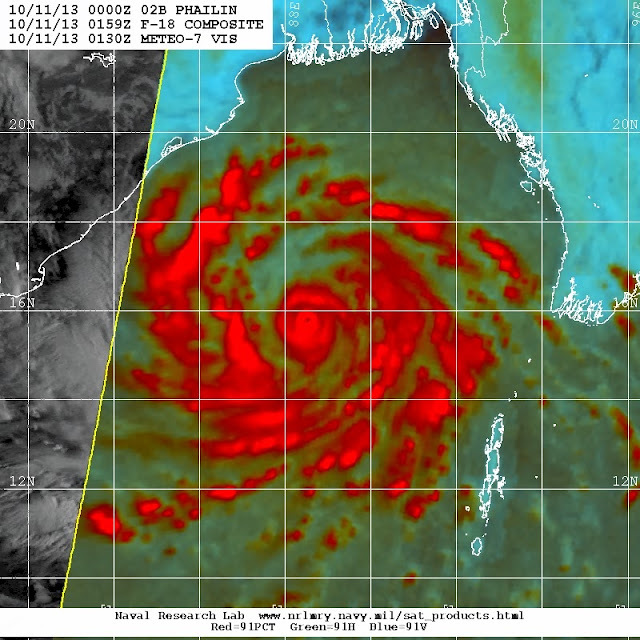 Tracking at 15 kms/hour, in a NW direction, and seeing it is 530 kms from Paradip (SSE), Kalingapatnam (ESE) and Gopalpur (SE), we can calculate its landfall in another 36 hrs from 005hrs IST (Friday). This calculated to Saturday evening. That means, the outer storms will take effect on the coast from Saturday morning . Alert warnings to North AP and Odisha coastline of strongest winds at 135-250 kmph, which are destructive. Please adhere to local warnings issued by govt. authorities. Heavy rains in Vasai.Most of the cyclone's specially the Severe one's always strike Andhra and Orissa coast. Raining in Andheri West since the last 45 mins. The rain oscillating between light to moderate. It's got very overcast and dark. Badlapur had 1hr medium to heavy rain for 1 hr period from west. Now cool and pleasent climate . Hoping that Phailin pull effect gives more rain till Sunday ! Under the influence of phailin storm Mumbai might get some good showers till Sunday, after that the rain's will Show steady decrease or even withdraw from Mumbai and North Konkan.